At NewGrass we are not out to cover the World in synthetic grass we offer the best most environmentally friendly solutions to outdoor living spaces that can not support real grass. In the beginning, it wasn’t about creating the best synthetic grass. In the mid 1950s, James M. Faria and Robert T. Wright patented a new kind of grass, Chemgrass. It was the result of a collaborative effort between the Education Facilities Laboratory of the Ford Foundation, in conjunction with Chemstrand and Monsanto Industries. The collaboration trio began to encourage schools to install synthetic carpet as a solution. 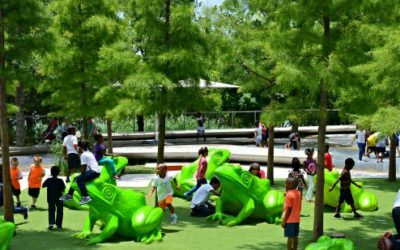 From 1962-1966, the collaborative group shifted focus to outdoor play areas. They began testing new play surfaces. Each surface was tested for things like water drainage, flammability, foot traction and water resistance. The result was Chemgrass. In 1964, Moses Brown School in Providence, Rhode Island received a new Chemgrass turf field. This also happens to be the moment synthetic grass history is made. As it happens, the Moses Brown install was the very first large scale synthetic grass field project. It was a result of the group’s research. From 1962 through 1966, The Creative Group, Chemstrand’s research organization, worked on new playing surfaces and tested the surface for foot traction, water drainage, flammability and water resistance. The Moses Brown install was a success. 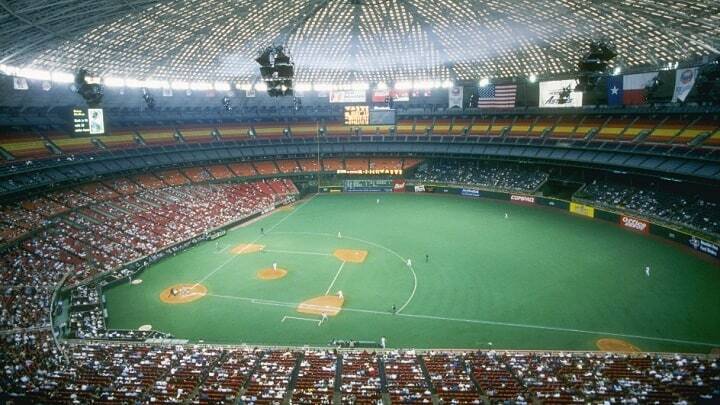 However, it was not very popular until the Houston Astros used it as a field base for the Astrodome. Seems like the new field did not allow for grass to grow very well. In fact, portions of the field were often painted green because they were lackluster, withered or dead. The Astrodome featured frosted white panels in the ceiling. They caused too much glare for players. As a result, they were painted gray, which caused the grass to suffer from lack of light. 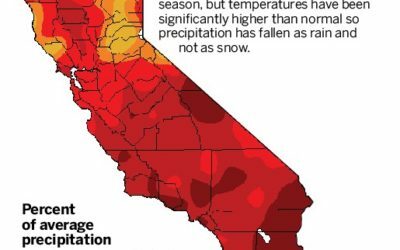 This is why synthetic grass was used. Necessity demanded it. Judge Roy Hofheinz (Astrodome developer) reached out to Monsanto Industries regarding a Chemgrass install. As a result, the Houston Astros Baseball team hit a synthetic turf field to play ball in 1966. The name got an update too. What was once Chemgrass would change to a more catchy title… Astroturf! 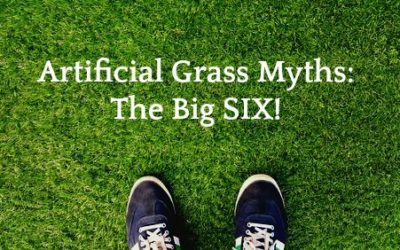 Once Monsanto received an official patent in 1967, synthetic grass was officially born! Yet to be honest, the stuff was horrible. For starters, it did not look very real. Okay, so to be completely honest it looked nothing like real grass. The sheen, texture and product construction were not good. Astroturf was maybe a half step above the old indoor-outdoor carpet you might remember from your grandparent’s back porch as a child. As a result, your chances of sustaining injury while playing at the Astrodome were significantly higher than playing at stadiums with natural grass. Yet, that did not slow down its popularity. Indiana State University Stadium installed Astroturf in 1967 along with Riverfront Stadium (Cincinnati), Three Rivers Stadium (Pittsburgh) and Veterans Stadium (Philadelphia). While many of us were enamored with the antics of Studio 54, bell bottoms and funk music, synthetic grass had its own coming of age. Round two development saw a shift from nylon yarn to polypropylene. You may remember this being marketed as “shag turf.” This version of synthetic grass was far less abrasive than its predecessor. Also, the tufts were farther apart. In short, it looked very much like real grass. However, it did not play well. This reduced attraction significantly. In fact, field hockey was about the only sport to find a home with this version of synthetic grass. It was unusable for sports like soccer because the ball did not behave like it did in natural grass. lt would be about 20 years (1996) before a synthetic grass field was invented that could be suitable for those type sports. Yet, the 1970s found synthetic grass Stayin’ Alive, despite its vast shortcomings. Third Generation is a Hit! The 1990s saw major improvements for synthetic grass. For starters, the main yarn content changed once again. Polyethylene replaced polypropylene yarns. 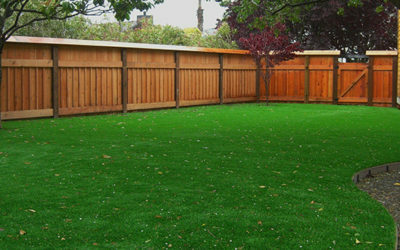 Polyethylene is much softer than synthetic grass made from polypropylene. In addition, several other improvements were made to the overall turf production process. For instance, a layer of dead thatch yarn was integrated into the backing to produce synthetic grass that looked as real as a natural lawn. Finally, infill was added to the mix to allow for drainage and support, as well as decrease player injury! In fact, third generation synthetic grass is what you see used for homes, businesses and sports fields today. It doesn’t show any sign of slowing either. Allow us to explain. Synthetic grass is NewGrass. And honestly, our products are the most real looking synthetic grass you have ever seen. Why is that the case? For the answer, we turn to the manufacturing process. Answers are found here because while the industry continues to innovate, major portions of production remain the same. Here is why NewGrass looks so real. First, a variety of materials are used to make the final product. 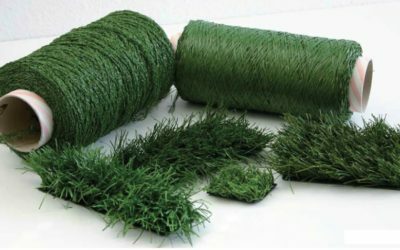 All three products mentioned earlier (nylon, polypropylene and polyethylene) are may be used to make modern synthetic grass. Raw ingredients are placed in a mold, then pass through an extruder to produce a yarn fiber with either a round or oval shape. Using both shapes creates variety so NewGrass products look and feel real. 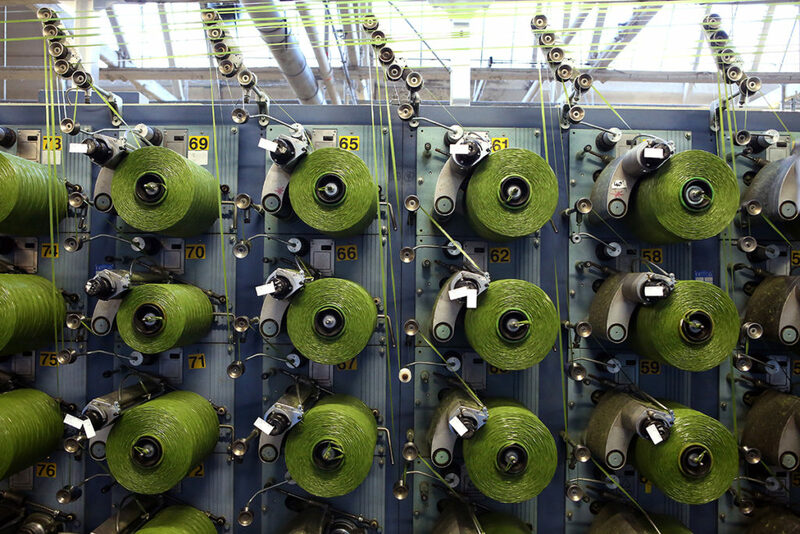 Synthetic grass yarn is extruded, spun, and ultimately loaded onto machines like this one to start the tufting process. Next, the yarn passes through a tufting machine. This process is incredibly fast. Each time the needles pierce the backing and pull the synthetic grass yarns through, they create a new row. 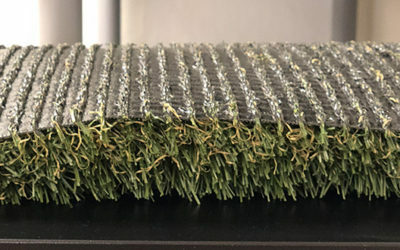 it takes a machine with hundreds of needles and skewers to accomplish this..
After this, the tufted product is fed through a machine that glues and sandwiches a rubber/latex backing to the initial backing where the artificial grass attaches. From there it passes through a marriage roller to ensure the glues spreads and seals evenly. After this, the product passes under heat lamps for the latex to cure. After curing, it passes through a machine which clips any outliers or odd yarn lengths so the product is uniform. Finally, this huge sheet of synthetic grass is cut, rolled and packaged for sale. However, ultimately, NewGrass is synthetic grass because of who we are as a company. In short, that means we keep up with industry trends, source the right products and value our customers. Here is what each of these means for you. This allows us to stay ahead of the curve regarding turf issues like fading and durability. With NewGrass, you can rest assured our products won’t fade. 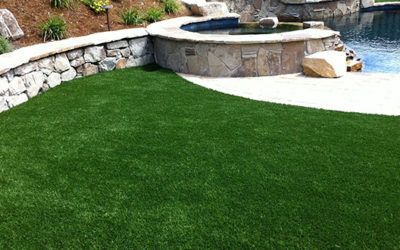 Every synthetic grass product we sell features fade resistant UV coating. In fact, this should be a standard feature of any artificial grass product. Before you make a purchase, ask if it will fade. Better yet, contact us. NewGrass makes sure our synthetic grass is on the cutting edge of innovation and yields top quality. Here is another reason we are the best synthetic grass company on the planet. Durability. Yes, NewGrass lasts! Once installed, it’s not uncommon for our products to look amazing a decade later. Why is this? Remember we talked about modern artificial grass using all three product types for manufacturing? Well, NewGrass only uses poloyethylene to make our synthetic grass products. It is softer (feels more like real grass), and looks more like real grass too. As for backing, we use an ultra-soft composite of non-woven eco-friendly EnvrioCel. It replaces around 90% of the petroleum compounds commonly found in synthetic grass backing. 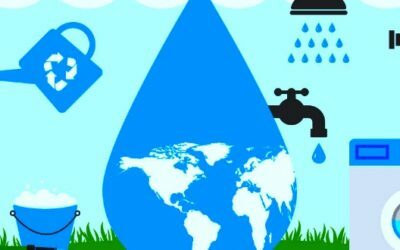 This is possible because EnvrioCel™ uses domestically grown soybeans and post-consumer recycled plastic (soft drink and water bottles) in its product make up. So it doesn’t just look natural, it’s green in every way! Before we sell one of our NewGrass products to you, we must be sold on the source. This means taking time to source the right ingredients. Doing our due diligence ensures we create the best looking artificial grass for our customer. The best way is to get one of our samples. They are impressive. They look like real grass! Poor quality synthetic grass is not an option with NewGrass. Being stuck does not mean being alone. 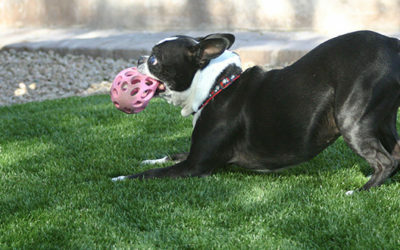 Sometimes, choosing the best synthetic grass can be overwhelming. At NewGrass, we understand this. It’s why we spend time listening to you. We can help you decide which grass is best for your budget. In addition, we can help you choose the best synthetic grass if space or budget restrictions are an issue. Finally, we are accessible. We have several distributorship locations and partnerships throughout the United States. This means you can get NewGrass wherever you are, whenever you need it. We pride ourselves in being accessible and efficient. So if you want the best synthetic grass has to offer, choose NewGrass. We carry the best synthetic grass products and will be happy to answer any questions or concerns you may have. We are sure you will find our staff knowledgeable, friendly and helpful. Synthetic grass continues to make strides as an industry. As such, NewGrass is in the best position to help you take advantage of them. It’s why we work with a variety of HOAs, commercial property developers, commercial construction companies and event planning companies. You can literally find NewGrass all over the United States, from New York City to San Francisco. How is that for product coverage? So choose the best synthetic grass for your next commercial project. NewGrass can help. We have the most real looking grass in the industry. We are regularly a part of huge events, cultural and community events, and name brand corporate giants. You can find NewGrass synthetic grass in lobbies, parks, walkways, rooftops and athletic fields all over America. All of this points to one thing. The best synthetic grass is NewGrass. Thinking of one should bring to mind the other. So don’t hesitate. Contact us today for the best, most real looking synthetic grass. If you are close to our company headquarters in Fremont, California, please stop by! If not, reach out any way. We can help you choose! You will be glad you did. Synthetic grass is NewGrass. Let us show you why!